Indian Bank PO Recruitment 2018: Apply Online for 417 Probationary Officer Posts @ Indianbank.in. 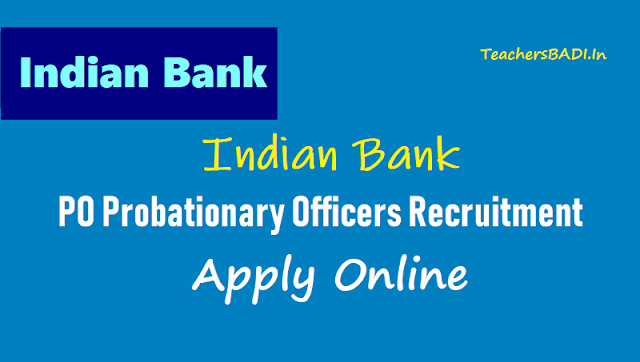 Indian Bank has invited application for recruitment of 417 Probationary Officer (PO) posts in the Public Sector Bank. The application process for Indian Bank PO recruitment has begun on the official website of the Indian bank: indianbank.in. The Indian Bank PO recruitment will be done through the admission to one year Post Graduate Diploma in Banking and Finance (PGDBF) course at Indian Bank Manipal School of Banking (IBMSB), which has been set up jointly by Indian Bank and Manipal Global Education Service Pvt Ltd. The Indian Bank PO recruitment application process will end on August 27 and the prelims exam will be held on October 6, 2018, Candidates for Indian Bank PO recruitment will be selected through a selection process consisting of online Exam (Preliminary & Main Examination) followed by Personal Interview. Admission to PGDBF at Indian Bank Manipal School of Banking (IBMSB) comes with the assurance of a full-fledged Banking career with Indian Bank as a Probationary Officer on successful completion of the course, said Indian Bank PO recruitment 2018 notification. Educational Qualification: Candidates should possess Degree (Graduation) with a minimum of 60% marks (55% for SC/ ST/ PWD) marks in aggregate in any discipline from a recognized University or any equivalent qualification as such recognized by Central Government. Age Limit: Candidates age limit should be between 20 to 28 years as on 01-07-2018 (i.e. a candidate must have been born not earlier than 02-07-1990 and not later than 01-07-1998 (both dates inclusive)). Age relaxation is applicable to 05 years for SC/ ST, 03 years for OBC and 10 years for PWD Candidates & other relaxation details refer the notification. Selection Process: Candidates will be selected based on Online Exam (Preliminary & Main Examination) followed by Personal Interview. The application process for filling 417 probationary officer (PO) vacancies through admission to Post Graduate Diploma in Banking and Finance (PGDBF) course at Indian Bank Manipal School of Banking (IBMSB) began on Wednesday. The application process will continue until August 27, 2018. The number of vacancies is provisional and may vary according to the actual requirement of the bank. Candidates will be selected through a process consisting of online exam (preliminary and main) followed by an interview. Successful candidates will go through a nine month course (campus programme) at Manipal Global Education Services, Bangalore followed by a three months internship at any of the Indian Bank Branches. On successful completion of the course, candidates will be appointed as probationary officer in any branch of the Indian Bank. Interested candidates can apply by visiting the official website of the Indian bank. Indian Bank PO Recruitment 2018: Steps to apply..
7) Note it down 8) Candidates can reopen the saved data and edit till the last date of edit /modification. This facility will be available for three times only. 9) Submit the application after it is filled and checked properly. 10) No change will be allowed in the application after its final submission. 13) Take a printout of the on-line application form and save it for future reference. The application process can only be completed in the online mode. The details about eligibility criteria, essential qualification, exam pattern and much more can be found on bank’s official website. You can also check it at the bottom of the text here.